I’m sure everyone knows it from Roger Sanchez’s Another Chance but this is a top tune in its own right. I guess Toto are seen as being pretty uncool(?) but they’re actually awesome and have released loads of music. Well, I say so anyway and I’m sticking with it. 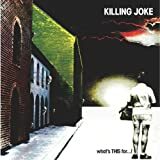 Post-punk stuff from Killing Joke who I seem to remember going on to do a load of industrial type stuff in the 90s that I didn’t particularly like. Taken from their second album this is pretty top stuff, especially for all the way back in 1981. Treebound Story was Richard Hawley’s old band who had a few releases back in the mid to late ’80s. It’s all lovely Smiths-like stuff with pretty melodies and weaving guitar lines, you’d be forgiven for thinking that it was Morrissey and Marr at the controls at many points. A nice little 80s indie tune in the same vein as The Smiths and all those jangly guitar dudes from 30 years back.